"It's 10 pm and I am the only person in the office, need some praise!" wrote a netizen working a lonely overtime shift to a WeChat group. People often come up with odd reasons to celebrate birthdays, but a group of Shanghai residents may have taken the cake for holding a birthday party for a bus line. Traffic police in Changsha, Central China's Hunan Province, released accident statistics that surprised a lot of people: men are almost twice as likely to be involved in an accident as women. Strapped to homemade flying devices shaped as gliders and even houses, competitors jumped into a river in the heart of Australia's second-largest city Sunday as part of a quirky annual competition to raise money for charity. A mischievous black, white and brown toy Papillon, known affectionately as "Dylan the Villain" has won what is billed as the world's largest and most prestigious dog show in Birmingham, England, on Sunday. About 400 esport hotels for young people to play e-games together and sleep have swept across China and become a new social hangout. A 116-year-old Japanese woman who still enjoys studying math and playing board games has been recognized as the world's oldest person, the Guinness World Records said Saturday. In a divided America where politics seems increasingly to get people's goat, a small town in Vermont has taken the concept to heart: this week electing one as mayor. Czech parliamentary speaker Radek Vondracek found himself in hot water on Thursday after media published photos of him standing on the speaker's table in parliament playing the guitar and grinning, apparently after a few drinks. Three university students in south China have developed a computer game resembling the board game Monopoly, but instead of Boardwalk and Park Place players land on the school's library or dormitory or the cafeteria. Wielding a weapon made of dollar bills, tackling Barack Obama, challenging George Soros to an arm wrestle — Donald Trump is the hero of a Tirana art show by an Albanian painter who considers the US president his "idol." An Albert Einstein "puzzle" has been solved thanks to a missing page of manuscript emerging in a collection of his writings acquired by Jerusalem's Hebrew University, officials announced Wednesday. 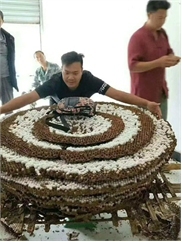 Entomologists in the border area between Pu'er, Southwest China's Yunnan Province and Myanmar have found what they say is the world's largest hornet, a likely subspecies of a killer hornet that has claimed numerous victims.